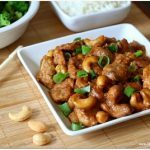 This crockpot cashew chicken is just as good as your favorite Chinese restaurant. It’s super easy and flavorful and it’s all made in the comfort of your own kitchen. Blot the pieces of chicken with a thick paper towel. You’ll want to get as much moisture off of the chicken as possible. Combine flour and pepper in resealable food storage bag. Add chicken. Shake to thoroughly coat with flour mixture. Heat oil in skillet over medium-high heat. When oil is hot, brown the chicken about 2 minutes on each side. Make sure you have a large enough pan that each piece of chicken can sit on the bottom of the skillet. After the chicken is browned transfer it to the bottom of the slow cooker. Cook on LOW for 3 to 4 hours. Gently stir in the cashews and let cook on low for about 10 more minutes. Serve chicken over hot cooked rice of noodles and garnish with sliced green onions.